The epic saga that Marvel has been slowly laying the groundwork for has finally arrived and comic book junkies everywhere are rejoicing! So you’re expecting me to talk about how this is a hyped up blockbuster that nerds are gonna sing about even though it really isn’t anything special, right? Frankly, I was expecting the same thing. I think myself quite a talent at judging movies from their trailers alone and The Avengers promos had me yawning. Then this movie goes and gets released and completely shatters my presumptions. Not only was it good, it was awesome. How did this happen? Iron Man disappointed and the sequel was pretty good yet deeply flawed. Captain America was overly cheesy. Thor actually was ok considering its 1950s era space background but plain and predictable. And no one has ever been able to create a good Hulk movie. 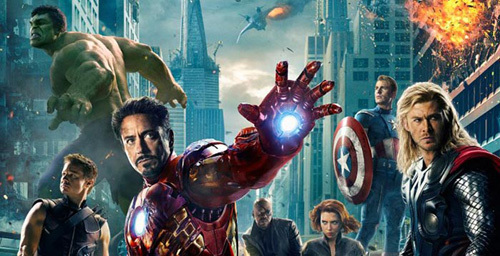 So how did The Avengers pull off the superhero stew? This is a case of the sum equaling more than the parts. When you throw a bunch of different superheroes together, the interplay between them is paramount. There really isn’t anything more important than that. Joss Whedon, who I just criticized for forcing the dialog in Cabin in the Woods, delivers a perfect blend of humor and sincerity. Every hero is cast extremely well and each actor gets to show off their skills in a number of scenes unhampered by special effects. I am astonished that even Samuel L. Jackson’s acting was decent. You need to give a director credit where it is due. As a personal aside, there is another story aspect that I find satisfying, more for its noticeable absence. There is no love interest- no damsel in distress. There are too many characters to focus on each’s high school crush and the film is better for it. Sure there are a couple of nitpicks. I always hate seeing the deus ex machina of a destroyed mothership automatically disabling all the bad soldiers on the ground. The Hulk fought all movie to be in control of his monster but at the end it was effortless and sudden- he didn’t overcome his inner conflict, the plot just glazed over it. The classic ‘U.S. government who just wants to nuke everything’ annoyingly comes into play but it is kept to a minimum. So there are eye rolling moments, but when they happen they are over before you can dwell on them too long and you are back to being awed by action. Speaking of which, the combat scenes feel ripped right out of the comic books. The action is better executed and more entertaining than any of the movies leading up to this one. Ever wanted to know what would happen if Superhero A fights Superhero B? The Avengers has a bit of that spliced about. But there are other interactions to sate our curiosity. What would happen if the Hulk tries to pick up Thor’s hammer, or if Thor slams Mjolnir into Captain America’s shield? Which team members would get along? All these answers are the keys to the film’s success, which is interesting, because the plot isn’t overly complicated and doesn’t have a legitimate ‘twist’ to it, but it unfolds slowly enough to stay fresh. Everybody knows from the get go what the big climactic clash at the end of the movie will be but the ride getting there holds your attention surprisingly well. One final note. The post-credit reveal that all of these movies are famous for is bound to be very generic for those unfamiliar with the comics. I am not a big Marvel geek but I am overly excited by the possibility of future properties. Two words: Infinity Gauntlet.